Sam started to take back his career in 1996 and turned to managing himself. His publishing company, Emily's Son Publishing, has been licensed since 1993 when his original work appeared on "Give It Up To Love". McClain formed McClain Productions after successfully co-producing his CD's with Joe Harley. And now, the last step of his independence has been realized through the creation of his own label, Mighty Music which release his CD "One More Bridge To Cross" in February 2003. His newest project, "Betcha Didn't Know" which reveals yet another side of MSM was released in July 2009 on Mighty Music with City Hall Records as the distributor. Sam greatly appreciated the nomination of this The Blues Association as "Soul/Blues Album 2010". 2008 brought Sam into the "Give US Your Poor" project, benefiting the homeless. He co-wrote (with saxophonist Scott Shetler) "Show Me the Way", which was included in the compilation where he and Jon Bon Jovi sung this stirring anthem as a duet. He continues to work with this project, performing at both The Lincoln Center, New Your City and at The Kennedy Center in Washington and other venues, sharing the stage with Natalie Merchant, and the smashing Greek tenor, Mario Frangoulis as well as the others mentioned on the CD. In early 2009, MSM was asked to record a CD of duets with Iranian folk vocalist Mahsa Vadhat. The resulting CD, "Scent of Reunion-Love Duets Across Civilizations" reached #6 in the European World Music Charts and this is a Mighty Sam McClain that has never been heard before! Mahsa and Sam have had concerts in Norway to celebrate this music. Sam and the guitarist for this project, Knut Reisersrud, are collaborating on a CD that will be recorded in Norway in January 2011. Also, Sam has sung the theme song for Ernest Thompson, (the Oscar winner for "On Golden Pond") for his new film, "Time and Changes. "Find the Sun" is a song written by Thompson and Joe Deleault (keyboards in MSM's band) but is recognizable a song that Sam has made his own. Furthermore, he will have a cameo in the film, singing it! 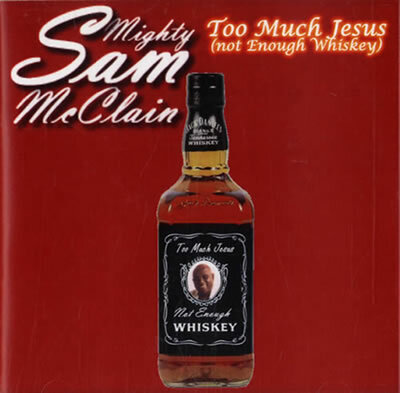 To top it of, Sam has recorded another CD-ready to go, called "Too Much Jesus (Not Enough Whiskey)" and the next music in the works. Pat Herlehy (Sam's guitarist) and MSM have a deep connection that is producing some great music. Mighty Sam McClain is in control - of his life and career as he continues to perform nationally and internationally. It's full steam ahead for this great vocalist! "The Soul of America" is what he is called in Europe - he is, just as his lyrics describe, "I'm a singer, a man with a song and I've got a message for you."